Five Nigerian Writers have emerged winners at the just concluded Ecuador/Nigeria Young Writers Short Story contest. The President of the Abuja Writers Forum (AWF), Mr. Emman Usman Shehu announced this in a statement. The winning stories are Wellington Street by Tunde Ososanya which won the first position and Canvas of Colours by Jude Valentine Badaki which came second. Other winning entries are The Tale of ‘Alvine’ Chike by Nzube Harry Nlebedim (third position), On The Shores of Death by Blessing Akinsehinwa (fourth position) while Killing Me Softly by Jojo Altine ElHassan emerged fifth position. The first Ambassador of Ecuador to Nigeria, Mr Leopold Verdosoto had announced the sponsorship of the Short Story Contest for young writers from Ecuador and Nigeria during the Guest Writer Session of the Abuja Writers Forum (AWF) in Abuja on June 24, 2017, where he said the winners will be published in English and Spanish, which are the official languages of Nigeria and Ecuador. 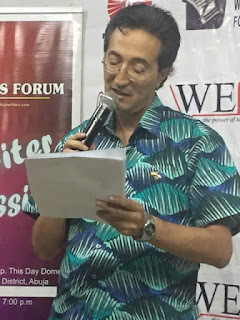 According to the President of Abuja Writers Forum (AWF), upon official announcement, several entries were received from young Nigerian writers across the country, despite the short time frame. Mr Shehu thanked the Ambassador for the sponsorship and the panel of judges comprising Professor Zaynab Alkali, Friday Ejilogo and George Bala for its impartial service.